The Pebble Beach Resort is without question, one of the most scenic and romantic oceanfront destinations anywhere in North America. The natural beauty of this area is simply stunning, and causes those who visit here to make heartfelt promises to return. Distant sounds of crashing waves, the sweet smell of clean ocean air, and the unmatched views, are guaranteed to put you in the mood for tantalizing food, extended romantic walks on soft white sand beaches, and good company. Scenic Ocean Vistas That Will Take Your Breath Away! 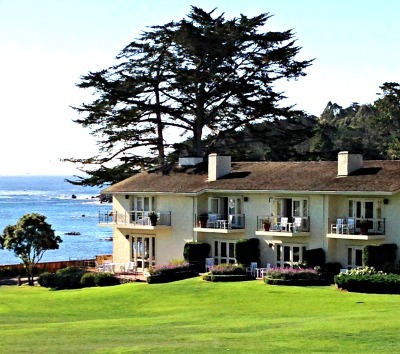 The Pebble Beach Resort has enjoyed celebrated status since 1918. The views from almost every vantage point are spectaular. If you enjoy dense forests and crashing surf, and love to see the natural world at it's best, then this is your place! 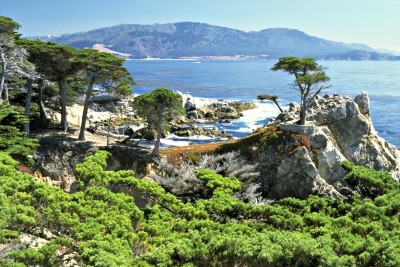 The views of the five thousand acre pine studded Del Monte Forest reaching toward the pounding surf are majestic. Voted One of the "World's Best Places To Stay" in Conde Nast Traveler in 2014, and one of the "Best Hotels In the USA" by U.S. News and Reports in 2014, the awards just keep rolling in. AAA Magazine gave the Pebble Beach Resort a 4 Diamond award in 2013 to add to it's long list of distinctive reviews. Pebble Beach Resort takes the fine art of cuisine seriously! You could sip on a beer, a vintage glass of wine, or an exotic blended cocktail, as you anticipate the evenings dining choices. You might relax in overstuffed chairs with views of the setting sun, or choose later to dine in a glass surrounded conservatory right near the 18th hole at the Pebble Beach Lodge. The Pebble Beach experience is one of total and complete relaxation. Everything is here for you to enjoy and dining at The Pebble Beach Resort is an experience to remember. Wake To The Sounds Of Pounding Surf At The "Lodge"
The Pebble Beach Resort and Lodge is a historic grand lodge with many rooms looking over the 18th green of the legendary golf course. The amenities offered the resort, the proximity to the Pebble Beach Resort Spa, and championship golf at your doorstep, make this a favorite romantic destination. Perfect For A Special Anniversary ... Be Pampered At The "Lodge"
Get All Our Suggestions HERE! 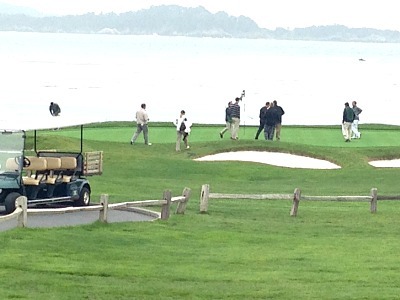 Pebble Beach Golf ... So Many Choices! Nowhere else in the world of golf does the18th hole get any better than here! 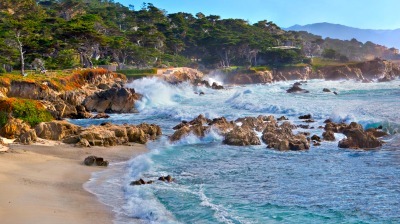 Try the Pebble Beach Lodge golf course one day and thrill in it's proximity to the Pacific Ocean. The next day, step into the Del Monte Forest and try on the challenging and newly redesigned Poppy Hills Golf links. As your afternoon of golfing comes to a close, end your day with great conversation while sipping a classic "Bench Sour" drink at the Terrace Lounge back at the "Lodge" ... and catching the final rays of the setting sun as it drops into the ocean seemingly just beyond your table. Seventeen Mile Drive is a place where you can truly discover the peace and tranquility of this part of the dramatic peninsula that juts out into the Pacific Ocean. This is a place to slow down. Avoid the tendancy to hurry on to the next "stop" on the drive to see yet another exciting view. Instead, take an extra 10 minutes listen to the sound of the waves as they crash onshore and to the seabirds and seals that cavort just a few hundred yards away. If the sound of pounding surf, long walks on the beach and imaginative cocktails haven't push away months of stress, consider a couples massage in the Fireplace Room followed by a sauna, deep body scrub or some time in the steam room. The Pebble Beach Spa is gigantic with 22,000 sq feet of structure designed with your total relaxation in mind. 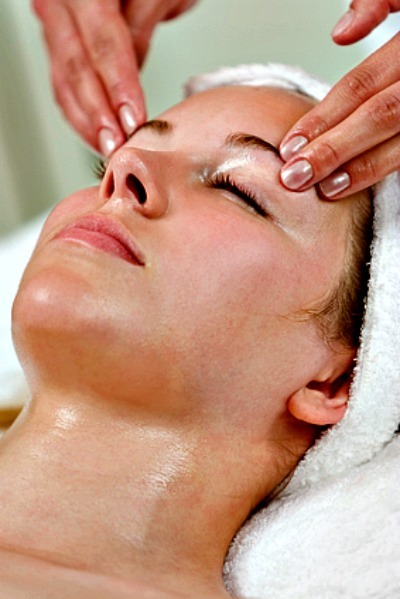 Fifteeen massage rooms, five facial rooms, and a makeup room are at your beck and call. Ready For Some Pampered Escape? Pebble Beach HorseBack Riding Tomorrow? In the morning, and after a much deserved rest, there is more to do before you leave this glorious slice of the California Coast. You could also stop in at the Resort Equistrian Center, and participate in a small group horse tour through the ponderosa pine trees of Del Monte forest and near the beaches of this magnificant setting. The groups are informal and a lot of fun. 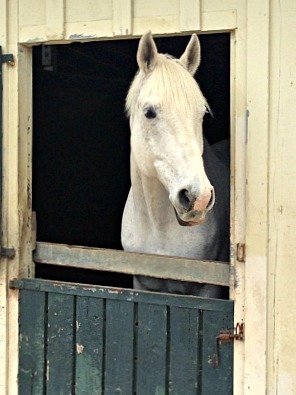 Ask if you can ride one of the "rescued" horses on your tour. Take An Informal And Fun HorseBack Ride Through the Del Monte Forest To The Beach!